Study this list of irregular verbs. Then practice them by filling in the blanks of two stories below with their past tense forms. You can also get a pdf copy to print and fill in. Click here to go straight to the practice exercise.
. Irregular Past Particles gives an alphabetical list of just the past participles that are different from their simple past forms. It also gives lots of examples of how to use them. 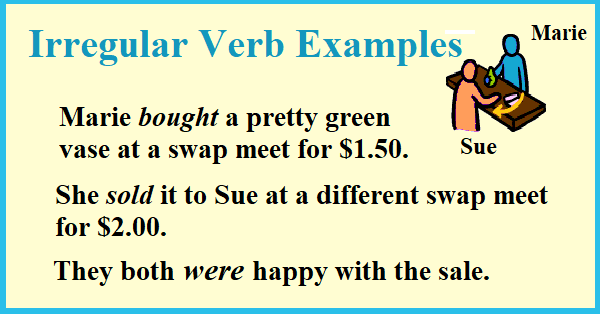 If you want an even more complete listing of even very uncommon irregular verbs (as well as flash cards and practice exercises), at English Page Complete Irregulars List. 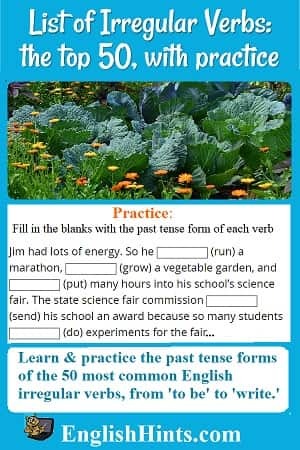 Practice Irregular Past Tense Verbs has more gap-fill practice like this page, but in a discussion of the history of U.S. immigration. Learn irregular verbs more easily with the patterns in these 12 lists. Learn and practice the past, present, and future English verb tenses (including continuous, conditional, and perfect tenses) on this page and the related pages it links to. You can find useful grammar practice exercises by clicking links on this page.